Posted by Editor at 1:38 PM . 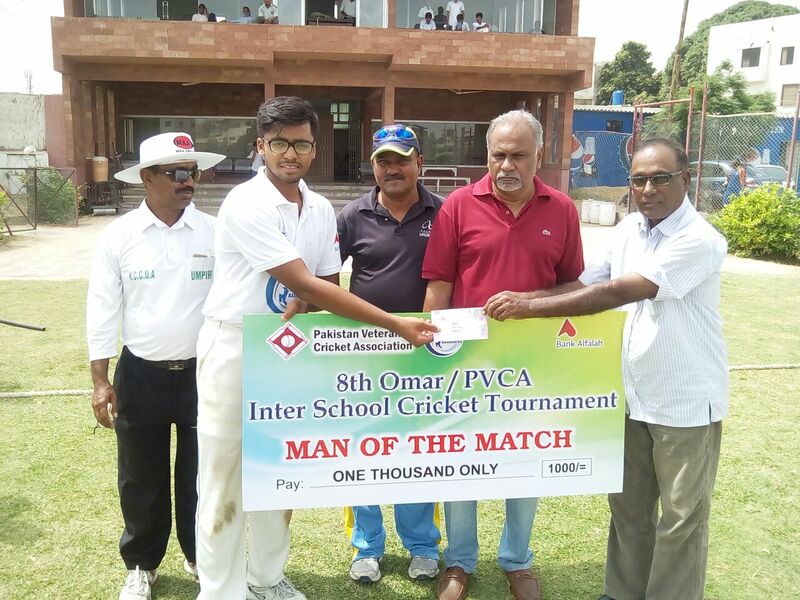 Zeeshan Secondary School and Qadri Model School overcame their respective rivals in the Group C encounters of the Omar Trophy Inter-School Cricket Tournament 2016, being organized by the Pakistan Veterans Cricket Association (PVCA). Zeeshan Secondary School defeated St Paul English High School by four wickets at the KCCA Stadium and Qadri Model School overwhelmed Qamar-e-Bani Hashim School by six wickets at the TMC Ground to inch closer towards securing a place in the quarter-finals. Electing to bat first, after winning the toss, St Paul English High School scored 185 for nine in the allotted 40 overs against Zeeshan Secondary School. St Paul English High School was helped by 51 extras, inclusive of 38 wides while Sohaib Sameer (30 off 49 balls) and opener Umar Abdullah (27 off 51) were the leading scorers and the wickets were shared between off-spinner Mohammad Muneeb (2-27) and medium pacers Mohammad Faizan (2-27) and Mohammad Bilal (2-30). Chasing a target of 186 in 40 overs, Zeeshan Secondary School was in a spot of bother at 63 for three before being rescued by Mohammad Muneeb and Haris Ijaz, who added 65 for the fourth wicket. Mohammad Muneeb departed after scoring 30 off 46 balls but Haris Ijaz, adjudged Man of the Match, continued to dominate the bowling and his 47-ball 69 with the help of two sixes and seven fours turned the tide decisively in Zeeshan Secondary School’s favour. He added another 51 for the fifth wicket with Mohammad Bilal, who returned undefeated on 21 off 26 balls as the winning runs came in the 33rd over. Abdul Basit’s fine all-round performance helped Qadri Model School to overpower Qamar-e-Bani Hashim School in the other match of the day. Qamar-e-Bani Hashim School, who batted first, was bowled out for 97 in 23.1 overs with Mr Extras (25) being the topscorer. Opener Mohammad Taqi (17 off 28 balls) and Haider Ali Zaidi (17 off 19 balls) offered some resistance but they lost their nine wickets for only 51. Medium-pacer Auranzeb Ahmed (3-29) was the pick of the Qadri Model School bowlers with the spin trio of Abdul Basit (2-15), Saad Bin Yousuf (2-15) and Azizullah (2-18) doing the rest. Qadri Model School needed only 9.5 overs to knock off the target 98 with Abdul Basit, making 32 off 20 balls with the help of one six and five fours, leading the victory charge. He was declared Man of the Match.